The Super Soaker CPS 2100 is the largest new soaker of 2002. 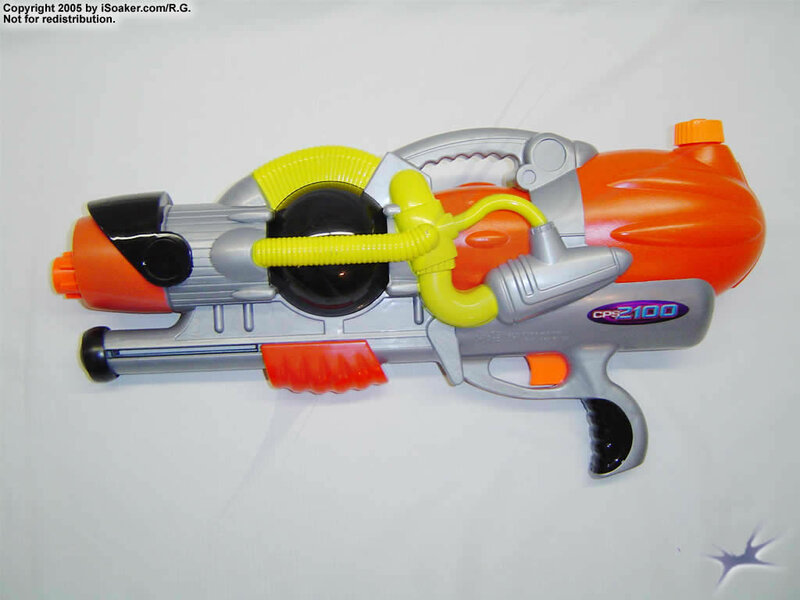 While the Super Soaker CPS 4100 is a larger soaker, that blaster is merely a Super Soaker Monster (2001) with its SC-capability removed and coloured differently; the CPS 2100 is an original design. The blaster, itself, is smaller than its older brethren such as the Super Soaker CPS 1000 and Super Soaker CPS 1200. Despite its smaller stature, this blaster packs a serious punch. However, first, the structural overview. The CPS 2100 feels rather sturdy like its CPS predacessors. The CPS 2100 is the smallest blaster using CPS-tech that features a track-guided pump. The next-smallest CPS that has a tracked-pump is the Super Soaker CPS 2000! Tracked-pumps are definitely more durable than the non-tracked counterparts and the CPS 2100's pump glides quite nicely along its track. The reservoir holds a respectable 2 L of water while the firing chamber can carry an additional 540 mL. The reservoir is actually comprised of the entire red section visible at the back of the blaster (including the smaller portion that peeks out between the false-yellow tubing). The reservoir is semi-translucent and has a tethered-cap opening. The reservoir, itself, slopes towards the pump-hole opening in the back-bottom, but due to the reservoir's shape and placement, the loaded CPS 2100 feels well-balanced when filling and carrying from its top handle. 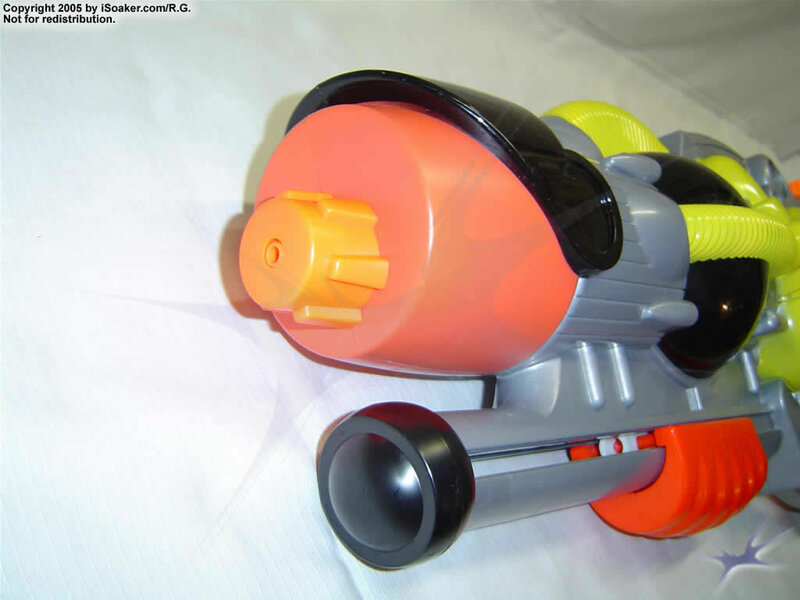 The trigger and grip are similar in design to the Super Soaker Monster (2001). Some people like the cresent-shaped back part of the grip while some find it chafing after prolonged use. One of the most pleasing things to find with this blaster is its increased output. After pumping up the firing chamber and squeezing the trigger, the force of the stream is noticeably stronger than its older brethren. Of course, increased output also means shorter shot time, thus short bursts are recommendable to increase the time in-between refills. Overall, the Super Soaker CPS 2100 is a welcome addition to the CPS line-up. The only real fault with this blaster is its lack of shoulder strap. Apart from that, the CPS 2100 has the payload and power to keep the pressure on in almost any soaker situation. Just beware of the heavy-hitter soakers (i.e. the Super Soaker CPS 1500/1700, Super Soaker CPS 2000, Super Soaker CPS 2500 and Super Soaker Monster X). Small, light, but capable blaster. Out-performs similar blasters of its size! Durable design with nice-tracked pump. Smaller reservoir size (mainly since its a smaller blaster overall) and no shoulder strap. Even though by 2002 the amount of great soakers being made had declined considerably, the CPS 2100 is one exception where a quality blaster was made and Hasbro actually got their head out their backsides (and then sadly put it back in again). The 2100 replaces the 1200 and is the final instalment in the small compact CPS line up consisting of the 1000 and 1200 before it. In terms of actual design and looks the 2100 makes a bit more of a notable attempt to breakaway from its counterparts, as it doesn’t really look much like anything that came before it, which is good, as it is a good original design. The colours and looks are great and this is actually a solid no nonsense blaster, just like John Smith’s beer, what a combination! One thing that is a great improvement and thing to see over the 1000 and 1200 is the addition of a tracked pump. This and the whole construction of this thing feels very sturdy and rugged able to take a beating (not that you should try it unless you really are that stupid), even more of a beating than Frederick Tatum. Pumping doesn’t take too long either, and as usual the power it gives off is great as usual. One of the main standout things of the 2100 is the output which is more than its counterparts. The whole feel of the 2100 as well is great so again just like its counterparts the main things that make a blaster like that so good are there. The range is also nice, good enough to wake your opponents up and make them aware you taking no prisoners. There are still places where the 2100 loses some credit. Main one being it comes with no strap, which even though making one for it isn’t that hard, it is still annoying. Good thing is that it is light, but still, having no strap is like organising a large insane party and then forgetting the finishing touches like the party bangers, ‘Oh crap someone quickly run to the shops and get some!’ Reservoir and firing chamber capacity are also less compared to its counterparts as well, and since output is larger you’ll need to watch out a bit more so that you don’t run out sooner than expected. As a whole the CPS 2100 is still a highly recommendable blaster and is a worthy addition to the smaller CPS blaster line up over the years beside the 1000 and 1200. It has slightly less power than the 1000 and is on par with the 1200, but makes this up in terms of its solid build mainly in the tracked pump, large output and still good range for its size. It won’t mess your wallet up badly either. Depending in what you look for in soakers like this, the 1000, 1200 and 2100 both have certain standout areas and also cons over each other; however the CPS 2100 is a wise choice if you decide upon purchasing one. Most air pressure soakers as well as the new crap are easy to take down. Similar blasters like the 1000 and 1200 are a good match and are beatable, as well as the underpowered Monster series too. Be wary of larger CPS’s like the 1500 and larger, you’ll need to rely on yourself more then. Skilled larger XP users are also a good match. Air pressure users watch out unless you know what you are doing. Mostly new crap soaker users stay away unless you want a challenge. Similar sized CPS’s like the 1200 and old XP soakers will make a 2100 user think more. Anything larger then a 2100 user will start to be more on edge. The CPS 2100 is a relatively new gun, released in 2002, and is still available in certain stores like Sports Authority. The CPS 2100 has a very compact design, a point proved when examining the internals. Additionally, some of the gimmicky ridges do contain vital tubing, a word of warning for those who aspire to add a strap. Yes, it comes with no strap, but this gun is pretty light and if you really need one, it is not too hard to add. Almost all the problems of the CPS 2100 can be fixed via modding. Especially in need of improvement is the range, which reaches 35ft at best. Some call it a good sniping blaster, but really, 35ft is hardly a sniping range. The good thing about the stock soaker is that the output is slightly higher and the shot time is a bit longer than the CPS 1200 and CPS 1000, the soakers most commonly used as benchmarks for it. The CPS 2100 does not have the best amount of shots per tank, so utilize tap shots and conserve water. The CPS 2100 is fine as a stock soaker and can hold its own against other small and medium CPS blasters, but avoid larger CPS guns unless you have advanced tactics and veteran battle experience. There are 3 marks of CPS 2100s; they are well known and well documented, as the founders of the CPS 2100 mark system are none other than myself and Nibordude! The CPS 2100 is a great gun with great potential! Most positions except HWO and sniper. The CPS 2100, one of the newer in the CPS series is one of the best Super Soakers I have ever used. It's super power is a force to be reckonned with and the size can fool unsuspecting water warriors. 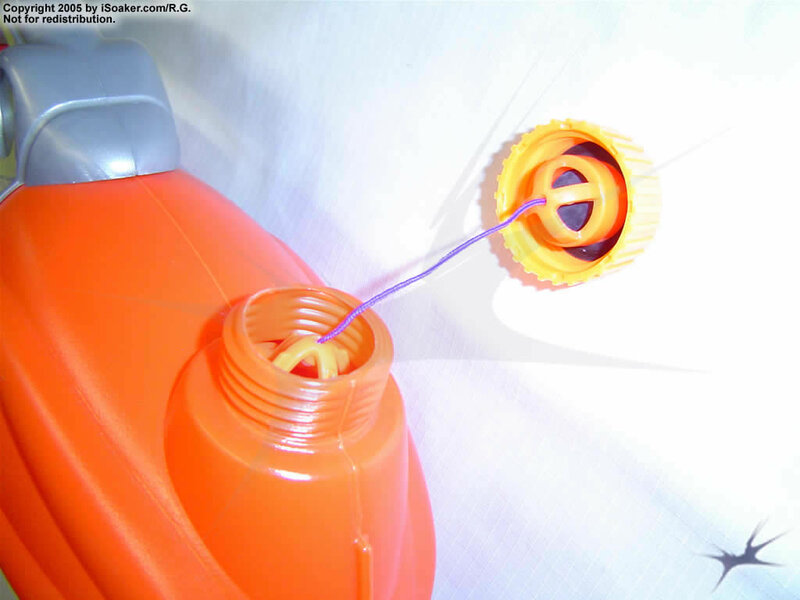 The 5x nozzle, while not the most powerful can do some serious soaking and I would recommend it for one hit kills missions. It's body also makes it useful for infiltrating enemy terratory because it's not very heavy, but very powerful. The only con I can think of is the tank capacity which, due to the water output, is a minor drawback. The CPS 2100 is the small shotgun among Super Soakers for its shape and power. This weapon should be absolutely the standard for every water fighter. Everything under its performance level should not be used for a big water battle. Its mobility and good proportional tank size makes it a Jack-of-all-trades soaker. The gun is also as powerful and robust as the Monster X so it should not be underestimated for having a small size. The CPS 2100 drawbacks include the absence of a strap which makes having a side arm more difficult. You also have only 1 nozzle size which prevents you to go head to head against the big CPS cannons or Monsters. The pumping is not as smooth as other CPS weapons, but fortunately, it will not require that many pumps. As a side arm, I recommend a Max-D 6000, a CPS 1000, a CPS 1500, or a Monster X if you can lift both, or a second CPS 2100. If you plan to use 2xCPS 2100, you better make a home made strap or holster for both. Overall, the power, low pumps, and good construction makes the CPS 2100 a must-have for water gun users and collectors. If you have the chance to get one, then buy it. It will be a wise decision. Well this is my review on the CPS2100. It holds a little more than a Splashzooka does: about 69 ounces. (I'm not quite sure about these numbers but what can u do. . .) It has, as everyone says, about three shots. NEED I REMIND YOU THAT IT HAS A VERY LARGE OUTPUT. The shotgun like effect, though, gives it a shorter range. It would be interesting to see how far it would go if you could stop the spreading of water somehow. balance - 8/10(could have used a strap but im sure you could make one somehow. Overall, this blaster RULES except for the fact that it uses water at a huge rate, but hey you can get people wetter faster!! The CPS 2100 is a good primary blaster. Not too big and not too small, it packs a very powerful stream with good distance. Similar to the CPS 1200 in use, but has a larger output rated at 7x. It is very versatile and is durable. The track-pump feature is a great improvement from the CPS 1200. This blaster lacks a shoulder strap and cannot be tucked under the arm because the handle is farther back, toward the tank. It runs out of water pretty quickly so be careful. Pros: Light, easy to handle, big output, durable. I just got a new CPS 2100 from Walmart. This soaker has a lot of power and kickback. The chamber empties pretty quickly and the reservoir holds about 3 1/2 shots. Comfortable feel and light when full. Range is about the same as a CPS Splashzooka due to its shotgun like qualities (stream breaks up almost as soon as leaving the nozzle). May have to fill alot (I used up the entire supply in about 3 minutes continous use). In my opinion, the CPS 2100 is a very good light rifle for those who can be patient and careful with the water supply.